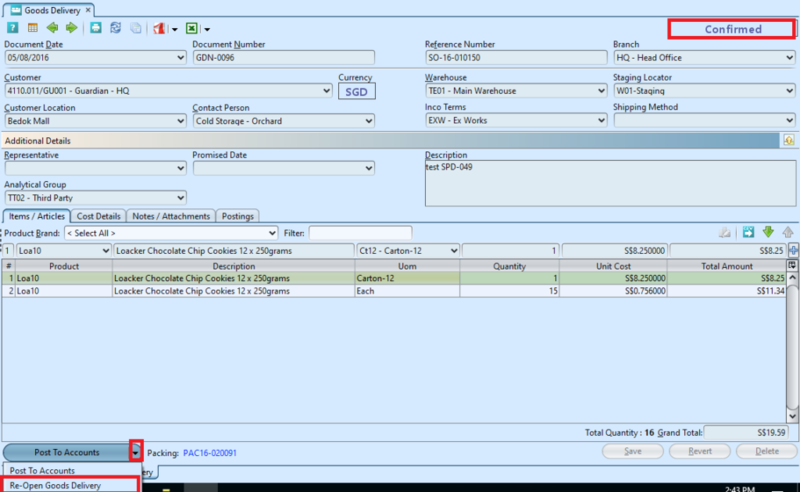 Goods Delivery view allows user to manage and process goods delivery for outbound items after packing process. 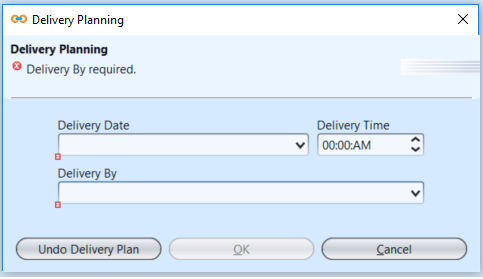 User can also set date, time, and assign which employee to deliver the goods using “Delivery Planning” feature. Confirm the goods delivery, save, revert and delete. 1. 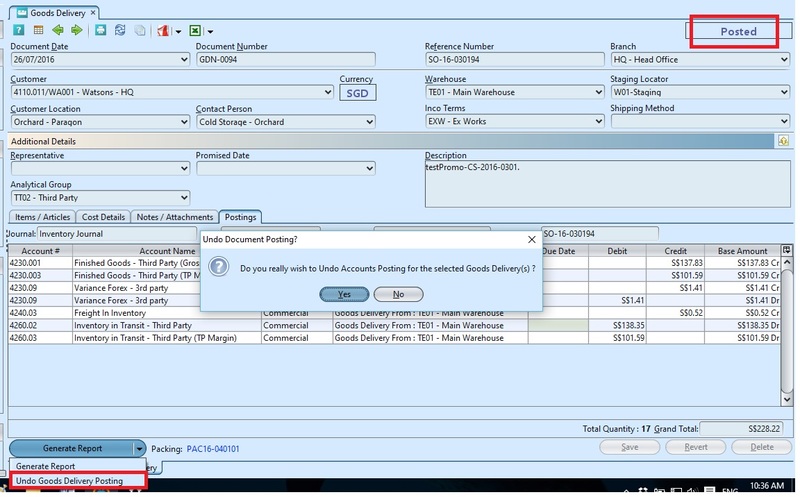 User generate goods delivery document through “Inventory – (Outbound) Packing” by clicking “Create Goods Delivery” button at the bottom left of screen of the packing document. 2. 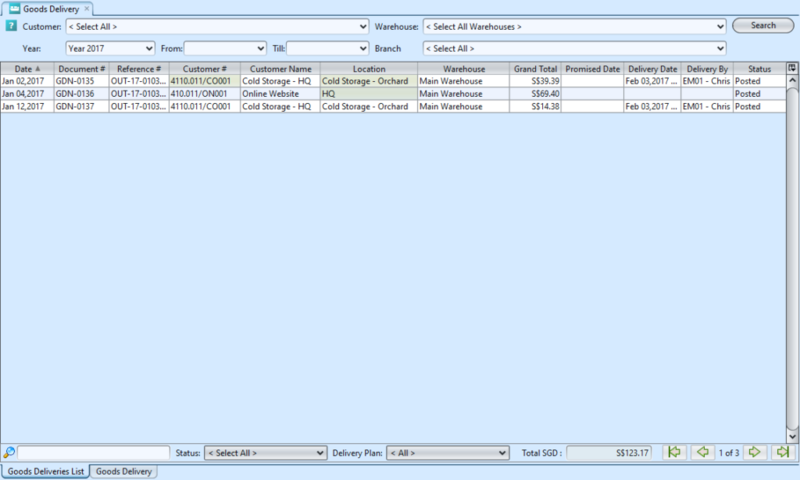 The cost details for the item will be automatically generated under “Cost Details” tab if there is any cost. 5. Click on “Confirm Goods Delivery” button at the bottom of screen to confirm the the goods delivery. 6. Click on “Post to Account” button at the bottom of screen to post to account. 7. Click on “Posting” tab at the middle of screen to view the details. 8. Click arrow on button on bottom left screen to generate report. 2. 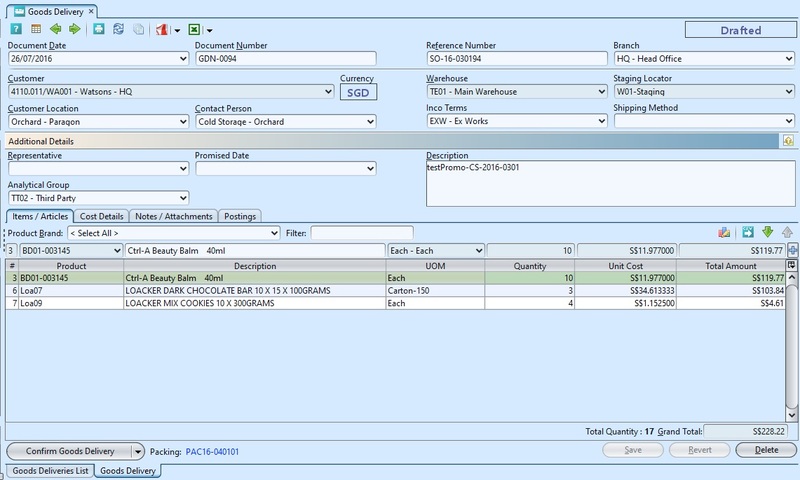 Double click on goods delivery document to be updated, it will bring up the details on“Goods Delivery” tab for the selected document. If the goods delivery’s status is “Posted” or “Confirm”, click arrow on “Generate Report” button at the bottom left of screen and reopen / undo approval of the document first. 4. Click on “Confirm Goods Delivery” button at the bottom of screen to confirm the the goods delivery. 5. Click on “Post to Account” button at the bottom of screen to post to account. 2. Double click on goods delivery document to be deleted, it will bring up the details on“Goods Delivery” tab for the selected document. If the goods delivery’s status is “Posted” or “Confirm”, click arrow on “Generate Report” button at the bottom left of screen and reopen / undo approval of the document first. 2. The user will be able to filter the list by Customer, Warehouse, Year and Date range and by Branch. 3. User can do a free style search of the delivery and also select the the records from the “Status” drop-down list for Drafted / Confirmed, Drafted, Confirmed and Posted. 5. 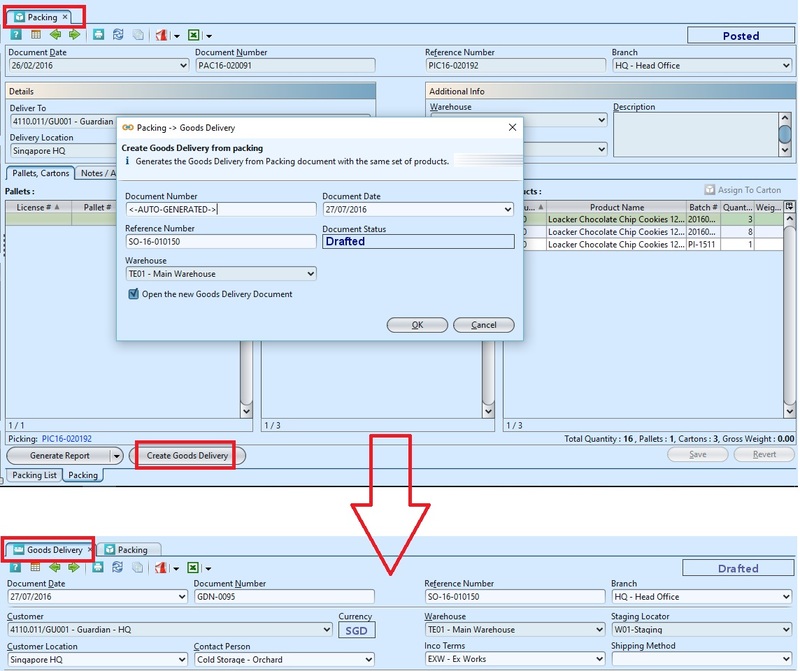 Double click on goods delivery to view full details of the document, it will bring up the details on “Goods Delivery” tab for the selected document. 1. Select “Goods Deliveries List” tab at the bottom of screen. 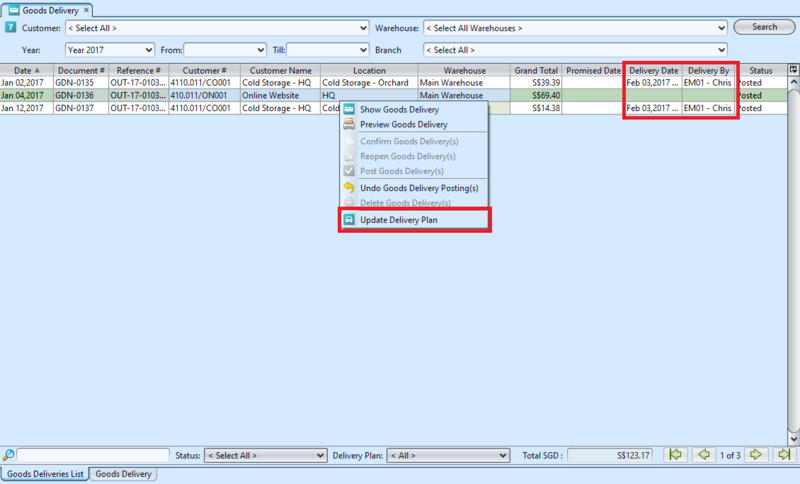 From the Goods Delivery List View, select the Goods Deliveries for which you want to update the delivery plan. Please note that this feature is access controlled and you need to have your administrator granting you the relevant access. 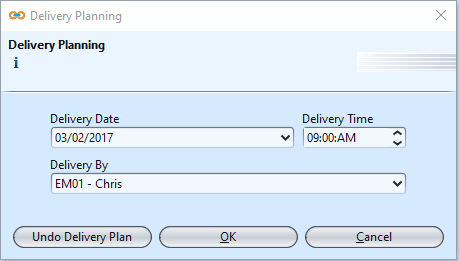 Click “Undo Delivery Plan” button to clear the delivery planning fields / values for the selected Goods Delivery document(s). 4. 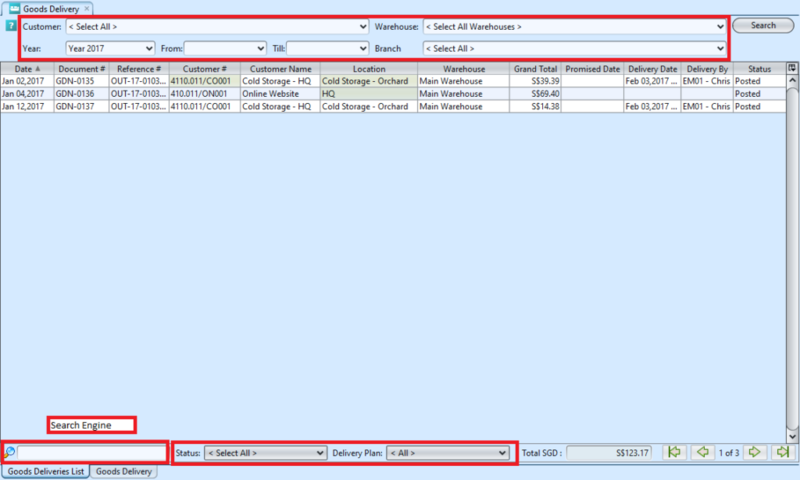 User can then filter the list of Goods Delivery document using the available filter or sort by the “Delivery Date” or “Delivery By” column.